The findings have recently been published in the prestigious international academic journal Proceedings of the National Academy of Sciences of the United States of America (PNAS) in August 2017. 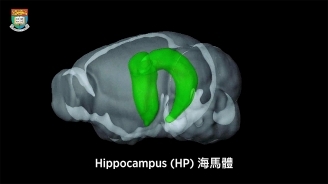 The hippocampus, located underneath the cortex, plays important roles in memory and navigation. Alzheimer's disease and other forms of dementia have been proven to have affected and damaged this area of the brain, resulting in early symptoms including short-term memory loss and disorientation. People with hippocampal damage may lose the ability to form and retain new memories. It is also closely related to other diseases such as epilepsy, schizophrenia, transient global amnesia and posttraumatic stress disorder. Furthermore, these results also suggest that low-frequency activities in the hippocampus can enhance learning and memory since low-frequency activities usually occur during slow-wave sleep which has been associated with learning and memory. Slow-wave sleep, often referred as deep sleep, is a state that we usually enter several times each night and is necessary for survival. Alzheimer's disease is a chronic neurodegenerative disease that usually starts slowly and worsens over time, and the most common early symptom is memory loss. These results may also have potential therapeutic implications of hippocampal neuromodulation in Alzheimer's disease. These current findings are a major step in furthering our fundamental understanding of the origins and roles of brain-wide functional connectivity. These findings also signify the potentials of rsfMRI and neuromodulation for early diagnosis and enhanced treatment of brain diseases including Alzheimer's disease, dementia, epilepsy, schizophrenia, transient global amnesia, and posttraumatic stress disorder. Professor Wu’s team is one of the world’s leading teams in functional magnetic resonance imaging (fMRI) research, particularly in the investigation of auditory and visual functions, and brain structural and functional connectivity. 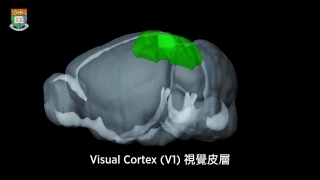 The pioneering technologies they employ include the use of optogenetics activation, pharmacological inactivation and fMRI to serve as an important tool for investigating the dynamics underlying brain activity propagation as well as the origins and roles of brain functional connectivity. The human brain is the source of our thoughts, emotions, perceptions, actions, and memories. How the brain actually works, however, remains largely unknown. One grand challenge for neuroscience in the 21st century is to achieve an integrated understanding of the large-scale brain-wide interactions, particularly the patterns of neural activities that give rise to functions and behaviour. In 2010, the National Institute of Health (NIH) in the US launched the Human Connectome Project which aims to “provide an unparalleled compilation of neural data, an interface to graphically navigate this data and the opportunity to achieve never before realised conclusions about the living human brain”. In 2013, the Obama administration in the US launched the BRAIN Initiative to “accelerate the development and application of new technologies that will enable researchers to produce dynamic pictures of the brain that show how individual brain cells and complex neural circuits interact at the speed of thought.” In November 2016, China launched its own initiative “China Brain Project”, which aims to advance basic research on the neural circuit mechanisms underlying cognition in hopes to improve brain disease diagnosis/intervention and inspire development of brain-machine intelligence technology. Based on current knowledge, one expects the hippocampus to predominantly generate high-frequency activities and these activities are largely confined within the hippocampus. However, in this study, low-frequency optogenetic excitation of the dorsal dentate gyrus, a subregion of the hippocampus, evoked cortical and subcortical activities which are beyond the hippocampus. 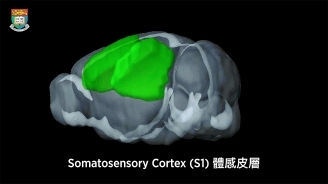 Furthermore, this low-frequency stimulation enhanced brain-wide functional connectivity in the bilateral hippocampus, visual cortex, auditory cortex and somatosensory cortex. Meanwhile, pharmacological inactivation of the hippocampus decreased brain-wide functional connectivity. In addition, visually evoked responses in visual regions also increased during and after such low-frequency hippocampal stimulation. Together, these experimental results highlight the role of low-frequency activity propagating along the hippocampal–cortical pathway, particularly its contribution to brain-wide functional connectivity and enhancement of sensory functions. The human brain only accounts for 2% of the total body weight, yet it consumes about 20% of the total body’s energy demand. Despite its importance, it is one of the least understood organs of the body. The research team’s findings have advanced our fundamental understanding of the origins and roles of brain-wide functional connectivity. 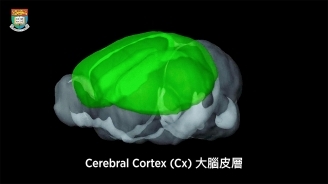 The emerging integrated technique adopted by Professor Wu’s team consists of optogenetics, pharmacological neuromodulation and functional magnetic resonance imaging (fMRI). Optogenetics is a neuromodulation method that uses a combination of techniques from optics and genetics to control the activities of individual neurons in living tissues. Pharmacological neuromodulation uses drugs to manipulate the activities of neurons. fMRI is a large-view non-invasive imaging technique for detecting brain-wide activations. Researchers can make use of fMRI to visualize whole brain activity in response to different optogenetic stimulation and pharmacological manipulations. The synergistic combination of the three technologies has enormous potential to spark a new age of interdisciplinary research to advance our understanding of the brain. This article has been republished from materials provided byHong Kong University. Note: material may have been edited for length and content. For further information, please contact the cited source.